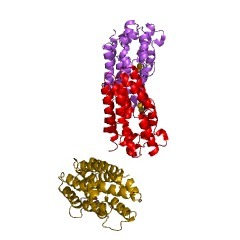 The CADD, Chlamydia protein associating with death domains, crystal structure reveals a dimer of seven-helical bundles. Each bundle contains a di-iron centre adjacent to an internal cavity that forms an active site similar to that of methane mono-oxygenase hydrolase (PMID:15087448). There are 6624 Haem_oxygenase_2 domains in 6617 proteins in SMART's nrdb database. Taxonomic distribution of proteins containing Haem_oxygenase_2 domain. This tree includes only several representative species. The complete taxonomic breakdown of all proteins with Haem_oxygenase_2 domain is also avaliable. Click on the protein counts, or double click on taxonomic names to display all proteins containing Haem_oxygenase_2 domain in the selected taxonomic class. Structure of the Chlamydia protein CADD reveals a redox enzyme that modulateshost cell apoptosis. The Chlamydia protein CADD (Chlamydia protein associating with death domains) hasbeen implicated in the modulation of host cell apoptosis via binding to the deathdomains of tumor necrosis factor family receptors. Transfection of CADD intomammalian cells induces apoptosis. 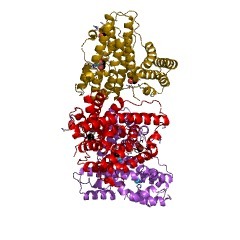 Here we present the CADD crystal structure,which reveals a dimer of seven-helix bundles. Each bundle contains a di-ironcenter adjacent to an internal cavity, forming an active site similar to that of methane mono-oxygenase hydrolase. We further show that CADD mutants lackingcritical metal-coordinating residues are substantially less effective in inducingapoptosis but retain their ability to bind to death domains. We conclude thatCADD is a novel redox protein toxin unique to Chlamydia species and propose that both its redox activity and death domain binding ability are required for itsbiological activity.